When Edward the Confessor died on 5 January 1066, Harold Godwinson rushed to London to be crowned king. But others also desired the crown, not least his outlawed brother Tostig. Tostig and his Flemish mercenaries fled to Norway and convinced Harald Hardrada to sail to England and restore Cnut's Viking lineage to the throne. The Vikings sailed into the Humber estuary before turning north up the River Ouse. Leaving their fleet at Riccall, Harald and Tostig travelled overland to Fulford, just outside York. The earls Edwin of Mercia and his brother Morcar of Northumberland were expert tacticians and after rallying the local fyrd they gathered their forces to defend the city of York. Rather than risk the city being sacked, they set up their defences on a low ridge in a nearby marsh. Meanwhile, across the English Channel William was also gathering his forces, but the northerly winds that had helped Harald were now hindering his own invasion plans. The attacking force is composed of two six point Viking warbands led by Harald Hardrada (Hero of the Viking Age) and Tostig Godwinson (standard warlord). Harald Hardrada may be accompanied by a Bard or a single unit of Gall-Gaedhill (Sons Of Death). Tostig's warband may include a single unit of Flemish Mercenaries. The defending force includes two Anglo Dane warbands led by Morcar, Earl of Northumberland (standard warlord; 3 point warband) and his brother Edwin, Earl of Mercia (standard warlord; 4 point warband). No other Sword for Hire units are permitted. The game is played on a 36" x 36" table. All terrain is placed by the attacking force. Germany Beck is a tributary of the River Ouse with a width no greater than M that is placed within L + M from the southern side of the table (A). Germany Beck is impassable except by way of one major ford with a width no greater than S (B) and one minor ford with a width no greater than VS (C). Fords may not be placed within M of each other. 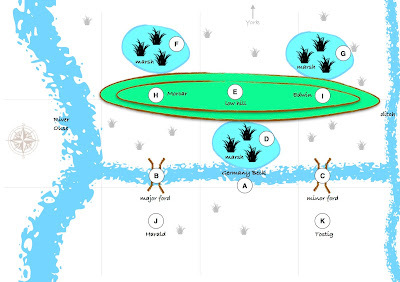 A small or medium marsh is placed between the two fords with one side touching the northern bank of Germany Beck (D). A low hill (standard elevation) with a length that should exceed L and a width that must not exceed L is placed with one side touching the northern edge of the small marsh (E). A small or medium marsh is placed opposite the major ford, touching the northern edge of the hill (F). A small or medium marsh is placed opposite the minor ford, touching the northern edge of the hill (G). No other items of terrain are placed. Morcar is placed on the hill opposite the major ford (H). Edwin is placed on the hill opposite the minor ford (I). The defending force then deploys their remaining units with as many figures as possible located within L of their respective Warlord. No figures may be placed within S of Germany Beck or either ford. After the defenders have deployed, Harald is placed on the southern side of Germany Beck between S and L of the major ford (J). Each attacking warband then deploys half of its remaining units with as many figures as possible located within L of their respective Warlord. No figures may be placed within S of Germany Beck or either ford. Remaining units are deployed along the attacking force's table edge at the start of turn 2. If available space prevents units being placed, they should be deployed at the beginning of the next turn as appropriate. The game immediately ends if both Morcar and Edwin are killed. Otherwise the game continues for 7 turns. Germany Beck is only passable at the two fords. Local tides mean that the fords may become marshy or even impassable. Turn 3 Both fords open. At high tide all flat ground not otherwise identified as terrain becomes boggy with movement restricted to S.
At the start of each game turn, any figures stood in impassable terrain are immediately removed as casualties. Any unit ending its movement with at least one figure in a marsh (including flooded fords) immediately receives 1 fatigue. At high tide, units must also roll 1d6 for each figure in the unit. One casualty is removed for each result less than the unit's armour value. The defending force has the first turn. The attacking force may not roll any SAGA defence dice. At the start of each attacker/defender turn both Warlords roll their SAGA dice together and complete their Orders phases simultaneously. They then proceed to complete their Activation phases simultaneously. Either Morcar or Edwin remain alive and both Harald Hardrada and Tostig are killed. The small English force has crushed the Viking invasion and Harold Godwinson is free to confront William at Hastings without the burden of first engaging in battle at Stamford Bridge. Harold's army is not subject to the fatigue special rule at Hastings. Either Morcar or Edwin remain alive and the defenders score more victory points than the attackers. The Viking invasion has been repelled. Caught between the northern shieldwall and Harold Godwinson's marching army, the Northmen flee back to their ships. Harold does not loose men in battle at Stamford Bridge, but his army is still subject to the fatigue special rule at Hastings. Harald Hardrada and Tostig remain alive, Morcar and Edwin are killed and the attackers score more victory points than the defenders. Triumphant, the Vikings regroup and then march on York but instead of sacking the city they agree to receive hostages at Stamford Bridge. Harald Hardrada or Tostig remain alive and the attackers score more victory points than the defenders. The Vikings forfeit their opportunity to regroup as they hastily march on York. Instead of attacking the city they agree to receive hostages at Stamford Bridge. Warlords 'killed' during the game are only injured. They automatically start the next game with 1 fatigue and always fight with 1 less die in melee (to a minimum of 1 die). Other troop casualties follow the rules described in Age of the Wolf. If the Vikings achieved a Major Victory each warband may immediately recruit 1 hearthguard, 2 warriors and 3 levy. Where possible, these figures must be added to an existing unit (following normal rules for equipment and maximum unit size). If no suitable units are available the recruits return to their longships and are not added to the Viking force. Swords for Hire units may never recruit. Initial playtesting revealed that canny Viking players had no real incentive to fully engage the Anglo Danes. Fighting would result in loss of men (including potentially both warlords) and since the Viking players know they have to face Harold at Stamford Bridge this could result in a rather gamey situation that makes for a very dull battle. I've therefore modified the victory conditions to ensure that in order for the Vikings to progress in the campaign they must not be defeated by the Anglo Danes. The low ridge on the marsh was a strategic feature on the battlefield. Therefore, as well as earning slaughtering points for killing enemy troops, both warbands also earn points for occupying the hill at the end of the game. At the beginning of the game, the Anglo Danes will be in control of the hill. The Vikings must therefore attack if they are to have any chance of winning. A minor victory for the Vikings will see them get to Stamford Bridge, but they will need to achieve a Major Victory if they are to recruit troops from their longship. Let's hope I finish painting them before they are needed in battle! This looks fun. We will try this down our club. Thank you for sharing.